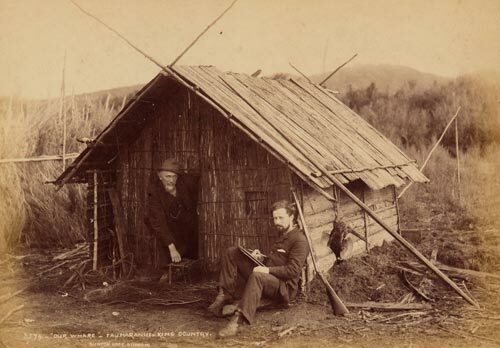 Photographer Alfred Burton, artist Edward Payton and surveyor John Rochford toured Te Rohe Pōtae in 1885 and recorded its people and landscape. Burton's photos in particular are seen as a valuable ethnographic record of Māori life in the region before Pākehā settlement. Burton (left) and Payton are pictured outside their Taumarunui whare. Burton is leaning on his camera case while Payton poses as if caught in the act of sketching.